We recently flew out with very dear friends on a whim to Las Vegas. This trip was purely based on dining at fine establishments and our favorites in the city. Our dinner at Joel Robuchon at the MGM Grand lasted way beyond four hours amidst inspiring and interesting conversation, beautiful ambiance and amazing food. Review of Joel Robuchon did not disappoint. We were looking forward to a one-of-a-kind dining experience, exceptional service, and of course an exquisite meal, and we were more than satisfied. Below are a few images of the restaurant taken from the website, and pictures of our sensational six course meal. (Hope it doesn't make you too hungry... ;) ) [caption id="attachment_9138" align="aligncenter" width="800"] Joel Robuchon Restaurant Las Vegas[/caption] [caption id="attachment_9139" align="aligncenter" width="800"] Decadent Butter tower from Belgium and Homemade Bread Cart[/caption] [caption id="attachment_9140" align="aligncenter" width="800"] Beet Carpachio and Caviar[/caption] [caption id="attachment_9141" align="aligncenter" width="800"] Amuse Bouche and Third Course[/caption] [caption id="attachment_9142" align="aligncenter" width="800"] Second Course and Entree[/caption] [caption id="attachment_9143" align="aligncenter" width="800"] Joel Robuchon Dessert Cart[/caption] Thanks for reading, have an Exquisite weekend and we'll see you here after the holidays! Happy Holidays! 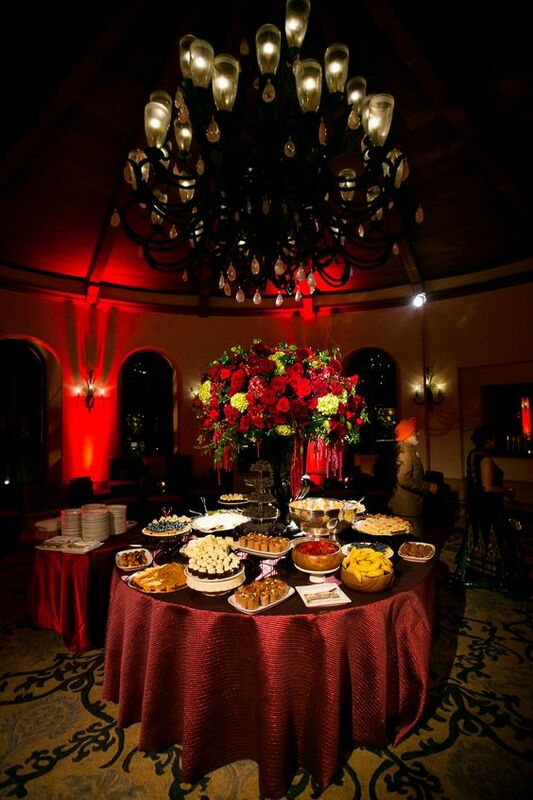 The reception for the couple took place at the exclusive Rancho Santa Fe Golf Club. The bride wanted a 1920s Paris look and Nikki was able to translate that into a beautiful vision. Long mirror top tables with exquisite linens were placed in all three rooms. 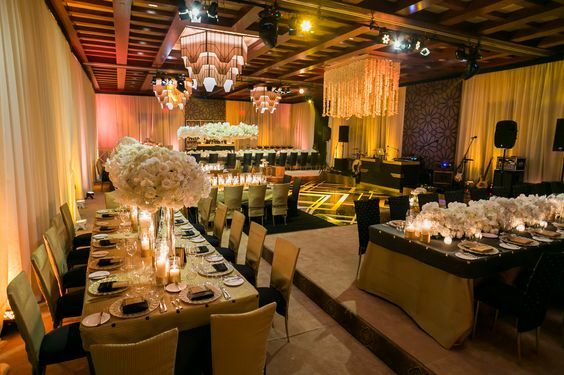 The middle room, which had the head table, was draped above in muted tones of champagne and taupe. Flowers were romantic with pearls and feather accents and tons of candles and candelabras ran through the length of the table. 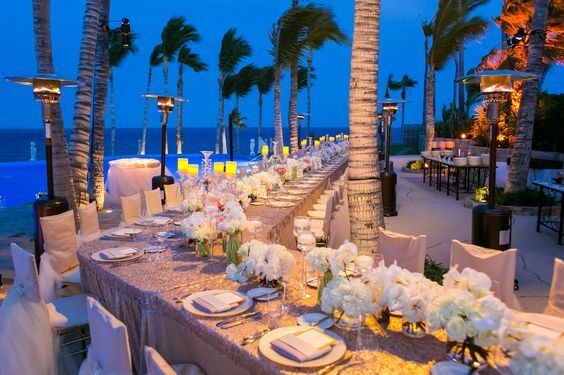 Each place setting was embellished further with chargers, beautiful menus and glistening stemware and flatware. 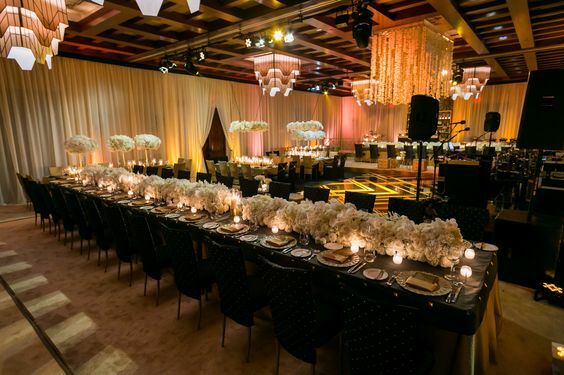 The room where couple was going to do the grand entrance, cake cutting and first dance had a gold and champagne dance floor, a piece de resistance with stunning linen for the cake table, gold color façade for the DJ booth, and a stage for the band. Lighting was done to perfection and the room looked magical and romantic per the bride’s vision with candlelight and ambient lighting. Guests were transported after the ceremony to the club in shuttles where a string quartet entertained them. They noshed on tray passed ors d'oeuvres and a specialty drink along with full bar. Once the room was revealed amidst ooohs and aaahs, the couple made their entrance and went straight to the dance floor. After the cake cutting and speeches, guests dined on a delicious four course meal with a tremendous dessert bar to finish the evening. The bride changed into her Alexander McQueen short dress when dance floor opened and the four day events came to a spectacular end. Thank you for reading, have an Exquisite weekend, and we'll see you here next week! According to Aishya's parents, she always dreamed of having her wedding at the house and parents were very happy with that. Nikki and Madiha loved the grounds of their vast property at the site visit and decided to put the mandap in front of the old established tree with the beautiful orange grove as a backdrop. 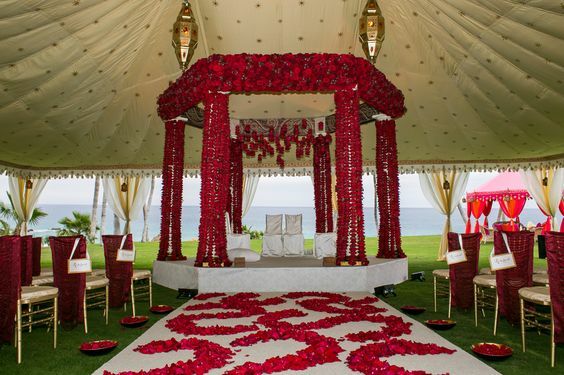 The mandap furniture was carefully selected and matching ghost chairs in amber were placed in a semi circle so all guests could have a clear view of the ceremony. 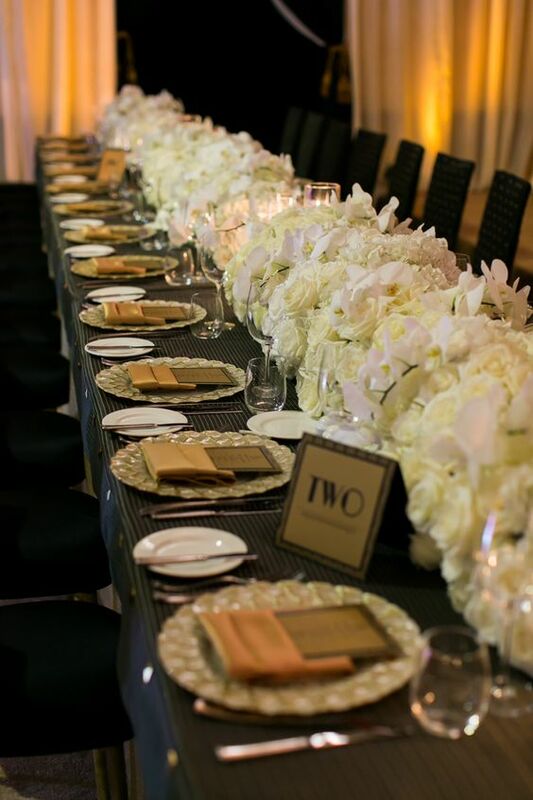 The bride had requested very elegant scrolls for programs in ivory and gold that were placed on each chair along with some savory snacks. 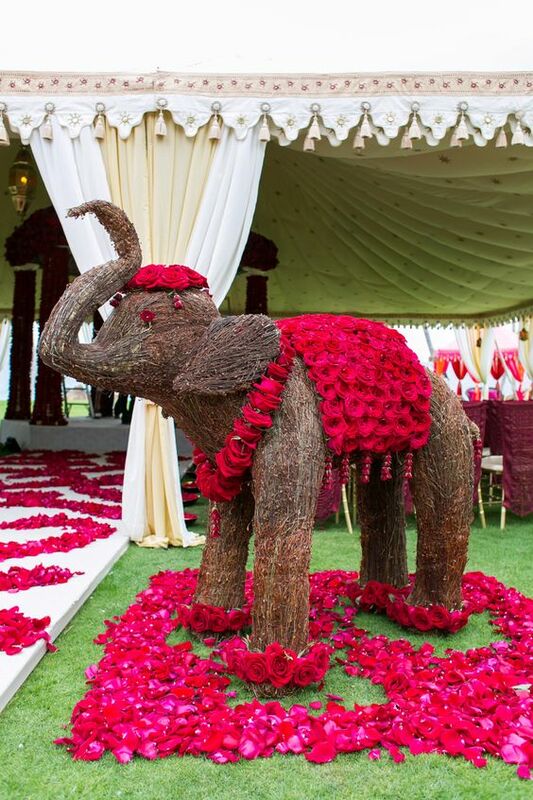 Since the client's property sits on a five acre lot and has a long driveway, it made for a long baraat procession with a drone capturing images from above! Guests were served cold lemonade upon arrival at the front of the property and made their way to the ceremony area. The bride walked down the aisle accompanied by her father. The pandit performed the ceremony explaining each step and kept the guests entertained with anecdotes. 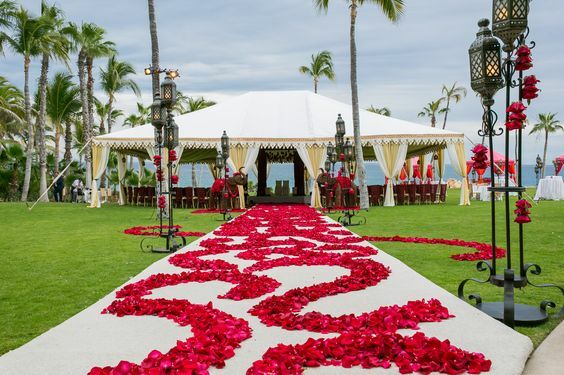 The ceremony ended with the couple being showered amidst tons of rose petals and left in a vintage Franklin. Guests were served pink champagne upon departure and headed for the golf club to attend the couple's reception. Thanks for reading our blog, and stay tuned for part 4 next week! Have an Exquisite weekend! Madiha and I had the pleasure to visit One and Only Palmilla in Cabo these past few days. This visit was for a client’s upcoming destination wedding at the beginning of the year and the main focus was to have a comprehensive design walk through for the client’s multiple events. In the few days, we were able to accomplish a lot with the help of lovely Arianna at the resort who was instrumental in setting up appointments for us with local partners. It was exciting, invigorating and amazing to meet some of the most talented people in the industry. One and Only is the most exclusive resort and from the moment our private car pulled up at the airport to the ride to the resort, it was a great experience. The car was fully stocked with all the amenities and our driver was friendly, courteous and professional. As we pulled up the front driveway the staff was there to welcome us, including Arianna. We went over our scheduled meetings, which were back-to-back starting at 8:30 am on Monday and checked in to our rooms. The staff at the resort is very professional and fluent in English and the butler is at your beck and call. Once we checked in, Madiha and I went over our agenda for the next day and after a delicious lunch decided to take a stroll around the property. Monday was a full day with meetings with florists, rental companies, lighting and everything in between. We also toured the property with Arianna to see each space where the events are going to be held. Our last meeting ended at 6 pm and by then, we were quite exhausted. A great dinner at the resort did the trick and we were able to catch up on some emails and work. The next day was the meeting with the chef to discuss various menu options and what a pleasure it was to spend some time with him. We again met up with some more vendors and had a lovely exchange of ideas. Of course you would not expect anything less from a Jean George Vongerichten restaurant! Seared is a Michelin-starred steak house on the resort. A new glass-walled meat cellar features 15 different cuts of the finest meats from around the world - from Rib Eyes and Tenderloins to Wagyu A5 certified and Kobe beef. We had a delicious meal and a lovely time enjoying the live music and the dreamy ambience. A verdant oasis on the tip of the Baja Peninsula. Where azure waters greet the mountainous desert and the Pacific Ocean merges with the Sea of Cortez. One&Only Palmilla is where warm waves break onto a dramatic shoreline… and grey whales can be seen rising majestically in the distance. Here, the gracious style of Old Mexico - with its red-tiled roofs, whitewashed walls, and idyllic setting of exquisite fountains - is quietly nestled amidst swaying palms, bird of paradise and other tropical bloom. This was an event that we will not forget, nor will our amazing vendors, or our clients! Talk about everything coming together in a bind! In Southern California, where it rarely rains, we are usually considering tenting because of the sun and the heat, but on this particular occasion, at the 11th hour, we were calling vendors all over Los Angeles to see who would be able set up tents in the middle of a rain storm. It was an engagement party of a client's son who is also a dear friend. The event was planned in three months and after a few design walk throughs and diagrams, a floor plan was selected keeping in mind something elegant and sophisticated for outdoors. The color palette of peach, gold and ivory was chosen to compliment the engagement invite. Production started at the beginning of the week with pool cover and carpeting, followed by rentals. The day before the event, the lighting crew came to do the extensive lighting and Nikki and Madiha were present the entire afternoon receiving deliveries and ultimately doing light check at 9 pm. The day of the event around 11 am, it started to rain like there was a hole in the sky and all our floor plan and diagrams changed dramatically and radically. We were fortunate to secure a tent company after making dozens of phone calls. The lighting crew had to come back to redo each and every light and amidst panic, helplessness and frustration, we managed to change the entire design aesthetics. We also emptied the house of furniture to create space for the dinner tables that were originally meant to be set outside. Needless to say, it was a long and wet day, but the vision came together as it always does. 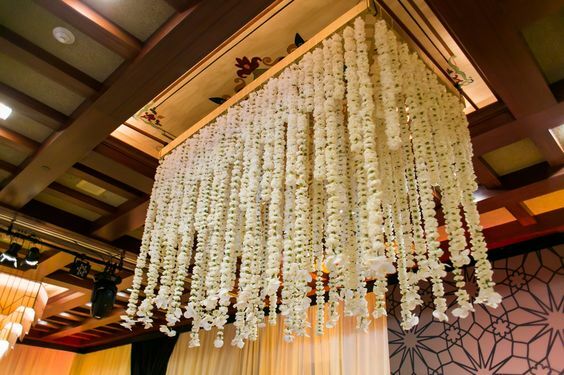 The setting became even more intimate and elegant by using the clients' home. Guests were welcomed by a harpist in the entry way, handed a glass of champagne, and guided out to the bar on the dancefloor adorned with the couple's initials. By now, the rain had completely stopped and the main tent looked beautiful with a lovely bar, dance floor and a full orchestra with an amazing vocalist. The bride's family was received at the main door and escorted to the drawing room where a short ceremony was performed and the bride and groom were blessed with gifts, and well wishes from family and friends. Then the bride-to-be and her family mingled with guests and enjoyed the evening. Food stations as well as tray passed appetizers were a huge hit and dinner buffet was sumptuous and elaborate. There was a beautiful dessert buffet laid out with ice cream cart. All in all the evening was a big hit and everyone enjoyed it tremendously. Our congratulations to the couple and both families!! !